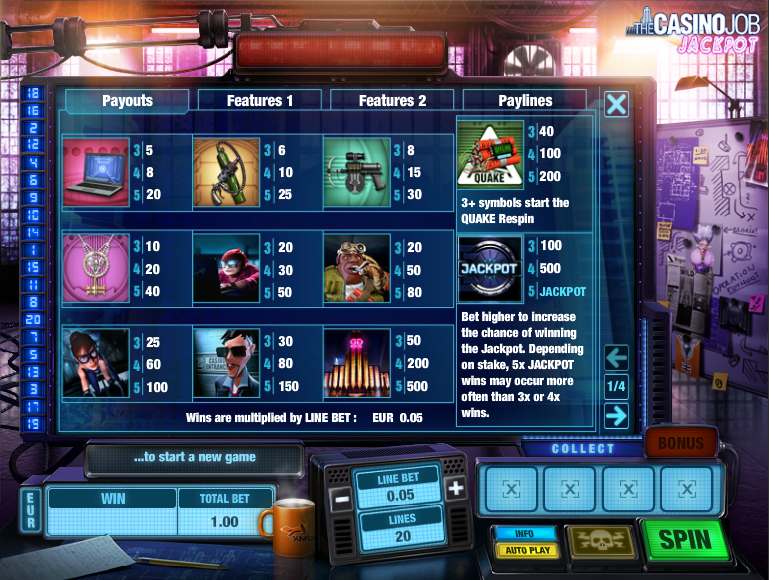 If you’ve ever fancied taking part in an Ocean’s Eleven-style casino heist then this online slot from Sunfox might just be the thing for you. Playing also has the added bonus of not actually being illegal so you get all the fun of the theft without the risk of length incarceration. The name of this release is The Casino Job Jackpot, it has a progressive jackpot so keep reading to find out what it’s all about. The Casino Job Jackpot takes place over five reels and twenty fixed paylines and the setting is an underground room where the heist is being planned. Subway trains can regularly be heard passing close by and there’s a white board full of plans to the right of the reels. The symbols are all them-related and include a laptop, a grappling gun, a tranquilliser gun, a necklace, four shady-looking characters, the target of the heist – the giant casino and the vault. Special symbols include the Las Vegas Times wild, the Free Spins circuit board and the Quake icon. In the base game only, the wild symbol will expand to fill all reels if it can make a winning combination. 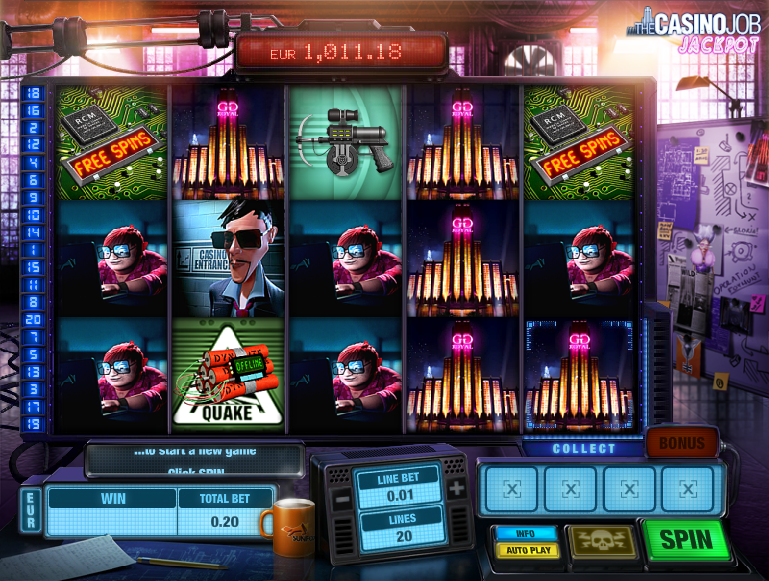 If you can land three or more of the Quake symbols on an active payline, your explosives expert will appear on the reels and blow everything up, revealing rearranged reels and some guaranteed wins. Three or more of the circuit board scatter symbols anywhere on the reels will trigger the free spins round; your hacker will take control of things and the reels will turn a shade of blue as he plays through them. When the spins are over he will keep pressing the yellow button to increase the prize multiplier. Reel five contains four different objects related to the theft on a background which says ‘Collect’. Once you’ve landed all four on the bottom position this bonus round will begin. If you leave the game and come back again your progress in collecting these objects will be saved. Progress at any stage will win you a prize and the big bucks will be yours if you can open the vault. You can see the progressive jackpot total above the reels and the way to win this is to land five of the jackpot symbols on an active payline. The game’s developers make it pretty clear that the higher your stake, the more chance you have of winning the progressive jackpot. If that’s your aim, increase your stakes accordingly. This is a superb slot – 3D graphics and animations, loads of bonus features, a funky soundtrack, a proper storyline and a progressive jackpot. Best we’ve played for ages and well worth some of your time and money. The only downside is the slightly low RTP of 93.00%.